I generally make my menu for the week and go food shopping on Saturday morning. Sometimes it's hard to figure out what I want to eat all week long, and I'm not always crazy about the idea of buying veggies and things on Saturday for a dish I'm not going to prepare until Friday, so I've been making "breakfast for dinner" for the past couple of Fridays. 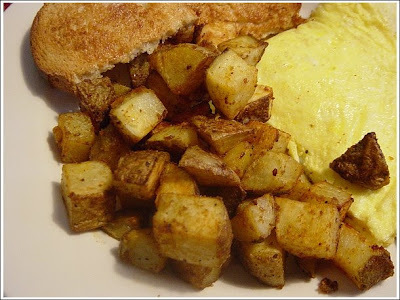 Nothing too fancy, a six-egg mushroom and cheese omelet, some sourdough or whole wheat toast, and some potatoes. I really like being able to come home at the end of the week and make a simple yet satisfying meal, and the thing that's really been making this meal has been the potatoes. Now I've extolled the virtues of potatoes with breakfast before, but I've refined my technique and seasoning a bit after trying many different recipes and cooking methods, and I think I've come up with something pretty good (and really easy). 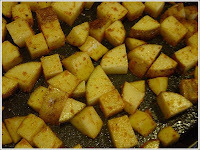 Start by preheating the oven to 400 degrees and cutting up some Russet potatoes into 3/4 inch cubes. I like to leave the skin on, but peeling the potatoes would be fine. Season the potatoes with salt, black pepper, paprika, onion powder, and garlic powder. Mix in a little vegetable oil and spread the potatoes out on a baking sheet that has been generously coated with cooking spray. Roast the potatoes on the center rack of the oven for 20 minutes. Remove the pan from the oven, flip the potatoes, and roast for another 20 minutes until the potatoes are nice and brown and crispy. Serve immediately with your breakfast item of choice and a little ketchup. I've done them that way for a long time. When we were on Oberlin Road I used the micro wave convection oven. They always came out crispy. You can use a variety of spices to create potatos for any meal. Yeah, I'm not breaking any new ground here, just putting down some numbers and technique for consistency. I think the spice ratio is perfect, as is the amount of oil (1 tsp per potato). A favorite potato of mine. i loke to keep a stash in the fridge for breakfast emergencies.